2006-2009: Team founder, captain, driver, mechanical lead, you name it. My semi-official title on the team is “Director of Everything Else”. Former Team(s): Worked with 229, Division by Zero, during my time at Clarkson, 2010-2013. 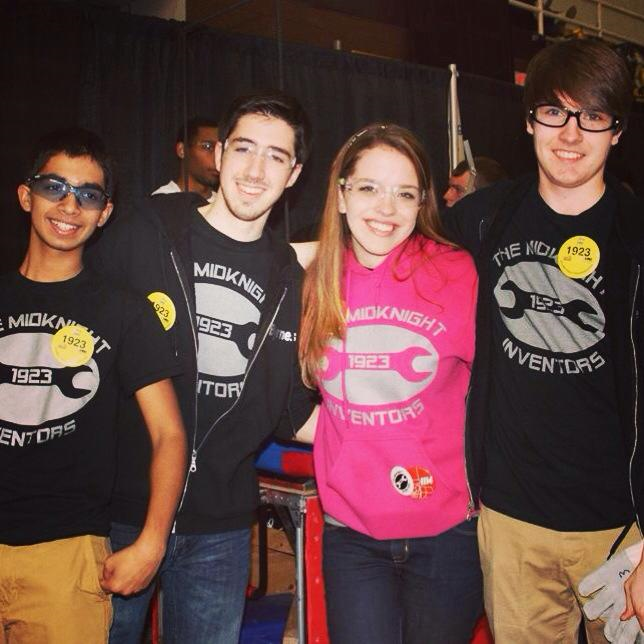 Location: I live in Worcester MA, but every weekend during the build season I drive home to Princeton NJ to work with 1923 – and during the weeks of competition I’m usually bouncing around to different events. Alright, so I guess it’s pretty easy to talk about how I got into FIRST (which helped me find my path) – my uncle founded the program, and my entire family works with FIRST in some way, which means inevitably kid-Libby was going to find her way to events. I loved the robots, even as a little kid – and talking to the teams about how they worked only further sparked my interest in building things. The time came for me to hit high school, and my district didn’t have a team. So I sat down in my principal’s office and said “Look. We’re GOING to have a FIRST team.” Not a question. Fortunately he gave me free rein to make it happen, and 1923 was born. I was a captain as a freshman, and stayed that way for four years, acting even as administrative lead when we didn’t have a teacher to help us. The team grew from 4 kids to 25+, and I was crazy proud of the program I’d left behind when I went away to college. (Fun fact, the 1923 roster now tops out at 105 students from multiple high schools.) I continued to work with the team from a (really-really-far) distance at Clarkson University. It wasn’t until I got to Clarkson (and my first few internships) that I realized that while I did love building things and seeing how they worked, I was also really enjoying our interactions with our clients and being able to use my writing and creative skills to help translate what the technical developments meant for our customers. I switched over to the Communications program my sophomore year, and I never looked back. My MechE freshman year helped immensely with my concentration in engineering, and that brought me to the program I’m in now. The goal is to be able to use my STEM background in combination with my marketing-side creativity to help tell the world about technology & science. I’ve still got a year left in my Master’s degree, so this time next year I should be able to talk more about where that takes me. Right now the answer to that is ‘full-time student with a summer internship’. I’ve had some really lucky opportunities to intern at FIRST and DEKA (Dean’s ‘day job’) in the past, but this summer I’m trying my hand at something I don’t already know, and interning at a company called NetBrain Technologies. They offer software that automates network diagrams and helps network engineers troubleshoot their systems. So far it’s a really interesting challenge since I’m still learning about the technology, but I’m able to put into practice everything I’m learning in my masters program, and I love it so far. I have about 15 years of conscious memory for robotics stories, but I’ll TL;DR a few of my favorites. 2) Another really great moment for me was 1923’s first regional win in 2009. I was a senior, a driver, and had spent four years fighting to keep the team alive – being able to get that gold medal was all the thanks I’d needed for my efforts. 3) More recently, as I’m sure most in the FIRST community know, my father (Dean’s brother) passed away in 2012. 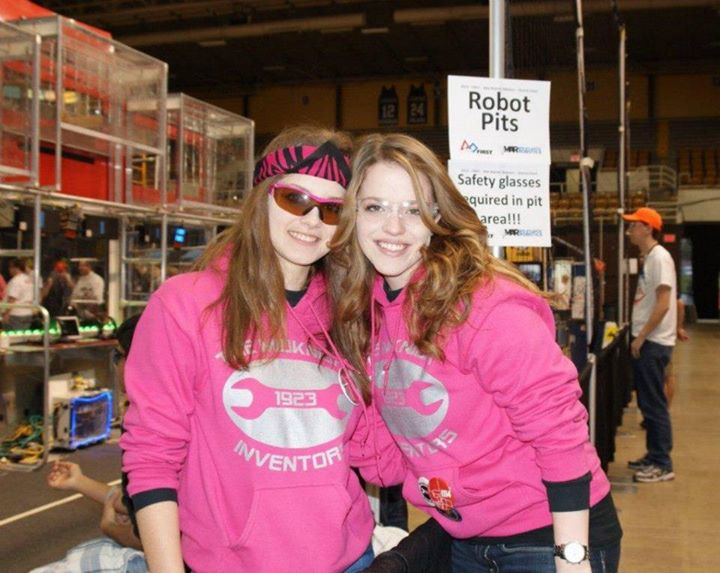 For the 2013 season, my team named the robot RoBART – and made a banner and stickers in his memory. I didn’t know about the stickers until their first event, when people sent me photos. At Championships we made another run of them to hand out – and the best moment of the Championship for me was when the kids on my team came up to me and said “Libby, we did it.” Did what? “We put a sticker on every robot at the Championship”. It’s things like that, that explain just how much I love the FIRST community. We’re one big family – and I know it helped my family get through that year. Thank you, all. It meant so much. I love 1114’s 2008 robot and its 2014 evolution. 254’s robot this year, too. Damn. 1923 has the strategic design stuff down (the what & the why), but when it comes to actually manufacturing things (the how) – we don’t have a machine shop or a machining sponsor. We build in a donated storefront with whatever we can get. So seeing those robots with those kinds of resources that are able to just demolish the game challenge is something our whole team aspires to. We’re a little more on the simple-but-usually-sorta-barely-elegant side. So I can pretty much guarantee that I’m gonna be the weird one here – I don’t use a whole lot in the way of apps! When it comes to planning out my to-do list, I’m a big fan of physical paper. I live and die by my Filofax. Recurring appointments go in my Google Calendar, but assignments, meetings, calls, you name it – they all go in my planner. However, for all the distance-mentoring collaboration, we love Google Drive, Hangouts, and Dropbox. Work: Pretty standard cubicle. Laptop, second monitor, keyboard, mouse, phone. I’m only here for the summer, so I haven’t done anything super fantastic with it. There are post-its EVERYWHERE, and that’s about as decorated as it gets. Home: Since I’m a graduate student, I spend a lot of time at my laptop writing or working on assignments. While I can do that from anywhere, I really like having a dedicated space in my apartment that’s just for work (and sometimes – okay, often – gaming.) It’s nothing particularly pretty to look at, but my apartment came with this little den/nook thing, so I’ve transformed that into my ‘chill zone’. I put string lights up so there’s some warm light, I keep my desk obnoxiously clear of stuff – laptop, to-do-list post-it, mouse, and whatever book or paper I’m working with. I’m notorious for not being able to work in a cluttered space – to the point where I’d clean my entire house top to bottom in college before I felt like I could get to work. Once my space around me is clear I can buckle down and work on what’s in front of me. At work, I won’t listen to anything, just because my office isn’t really an environment where you can tune everyone out. The marketing team is constantly chitchatting (about work, and about regular-life stuff) so it’s been fun to be a part of that for the summer. At home, it kind of depends on what I’m working on. For homework, I’ll usually throw on something without words – like a good video game soundtrack, or instrumental cover playlists on YouTube. If I’m just messing around with personal projects or playing video games, anything goes. I’m a big believer in ‘put my entire library on shuffle and see what happens’. Ha. This one’s fun. During the week, I’m at school in MA. Going to classes, doing my homework, skating, going to the gym, gaming, whatever. Come Friday, I pack up some clothes & my laptop, and I put the dog in the car and drive about 4 hours home to NJ. Sometimes it’s a short drive, and sometimes there’s a snowpocalypse and traffic and it takes me 6 hours to get home. I get home, leave the dog at my mom’s, and then we both head over to the build site. I once killed a fly with a nerf gun in my college dorm room. So there’s that. My mom and I are also really good at calling out what the song is within a few notes of it starting. She’s the Human Jukebox, I’m just her apprentice. I’m not really sure I’m ‘better’ than anyone else at something, other than just being me. That’s probably a really cheesy cop-out, but whatever. Obviously not a true statement on dance habits or gun control, but for me it’s a really important reminder to try and act when it’s needed and when it matters, rather than react before something’s even an issue. I’m not sure if I really have anything too ‘guilty’ on here- I’m not apologetic about the things I enjoy. I’ve got a crazy travel schedule during the season (and even during the summer/fall), so to me, being able to disconnect even during one weekend is a luxury I often feel guilty about. I’m always checking my phone- I’m an admitted social media addict, especially when it comes to things I love like #omgrobots, so being able to say goodbye to the outside world for a day or two just to have some ‘me’ time feels like I’m stealing away. It’s intensely needed, and it’s awesome. FRC’s very own Frank Merrick. He’s so awesome about being open with the FIRST community, and I think it’d be cool to see inside a sliver of his day at HQ. Twitter, Facebook, tumblr, whatever – you name it, and I’m always up for a chat with someone from our awesome community. This crazy little robot family is such a big part of my life, so I’m happy to just strike up a chat with someone new. I don’t bite, I promise!